New York City Department of Transportation (DOT) Commissioner Janette Sadik-Khan today joined elected officials and local community leaders to announce the opening of the rebuilt E. 78th Street pedestrian bridge over the FDR Drive in Manhattan, re-establishing a key connection to the East River Esplanade while improving the crossing’s safety, access and aesthetics. The $11.9 million project, funded by New York City Department of Parks & Recreation, included the removal of the original 150-ton concrete bridge in July 2011 and its replacement with a pre-fabricated 80-ton steel structure this past October. The new bridge features steel pier columns and walls for the ramps, which provide a fresh design that enhances the surrounding streetscape and views of John Jay Park and the waterfront. Council Member Jessica Lappin, Assembly Member Micah Kellner, Parks Manhattan Borough Commissioner Bill Castro and members of the 79th Street Neighborhood Association joined Commissioner Sadik-Khan at the bridge for the ribbon-cutting ceremony. "Improving access to our waterfront is a hallmark of this administration and with the reconstruction of the 78th Street pedestrian bridge, New Yorkers can better connect to the East River Esplanade to get exercise and enjoy its wonderful views of the river and Roosevelt Island," said Parks & Recreation Commissioner Adrian Benepe. "The Parks Department was pleased to work with Commissioner Sadik-Khan and her team at NYC DOT in restoring this important access point to our waterfront." Decades of use and exposure to the elements took a toll on the original structure, which was built in the 1940s. In 2006, the State Department of Transportation listed the bridge’s condition as “poor” in its biennial inspection. Given the scope of repairs and need for additional upgrades, DOT chose to replace the entire crossing, an impressive undertaking given its location over a key six-lane arterial highway. The new bridge, constructed entirely in Camden, N.J. and delivered by barge, includes wider sidewalks and approaches, pedestrian safety fencing and ADA-compliant ramps for added safety and improved access. The new bridge also sits higher over the road than its predecessor to provide more clearance for large vehicles, particularly for emergency responders. The project also improved lighting in the area, including replacements for nearby streetlights and the addition of decorative lighting on the E.78th Street approach. The contract also included re-pointing masonry for the retaining wall along E. 78th Street. During the design phase the bridge was transferred from DOT to Parks given its direct connection to the East River Esplanade. 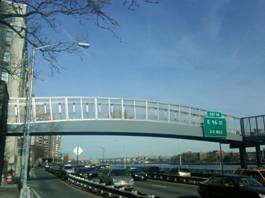 DOT will continue to maintain the E. 78th Street pedestrian bridge.